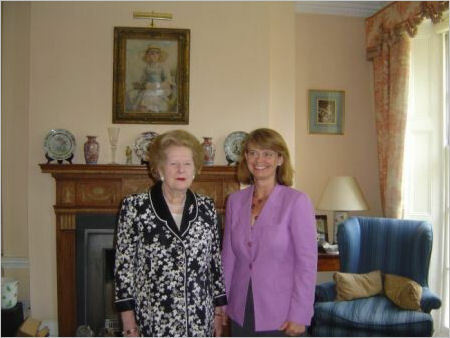 Harriett Baldwin, Conservative Parliamentary Candidate for West Worcestershire was honoured to be invited to a private lunch with Lady Thatcher yesterday. Lady Thatcher personally congratulated her on her selection. "It was an enormous honour to be congratulated by Lady Thatcher" said Harriett Baldwin. "She was on very good form. On a personal level, I owe so much to her Big Bang deregulation of the City. It opened up unprecedented opportunities for my generation. She started a process that has made Britain the dominant international financial centre of the world, driving the economy all over the UK and employing a million people in financial services, including many in Malvern and the surrounding areas. West Worcestershire is an ideal place to locate a financial services business. I recently met with Richard Simmonds, an enterprising Malvern man, who has established his finance business here and now employs 20 people. I also admire the way Margaret Thatcher stood up for Britain in Europe and in the world, unlike the Labour Party, which has so readily given up the British rebate from the European Union."